All answers for Word Popy, the Crossword Puzzle & Search game, can be found here. We have all the solutions you need to finish every level. 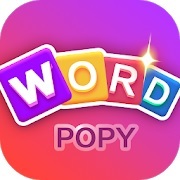 Word Popy contains very difficult levels which can give you a lot of gaming pleasure. But it can also be frustrating when you can not solve your level. And that’s why we are here to help you with all the answers you need. If you can not find your answers below, then enter the letters from your level here. We will show you any possible word to answer your level.